Harmony allows for the manual swapping of mouth position drawings to match a voice track. For this process, both sound scrubbing (listening to a soundwave broken up frame-by-frame) and drawing substitutions from the Library View are used. 1. In the Playback toolbar, enable the Sound Scrubbing button. 2. In the Timeline view, drag the red position indicator along the sound layer waveform. 3. When you reach a frame where a mouth position should go, for example, an open mouth with rounded lips for an "oh" sound, click on that frame on your mouth shapes layer. 4. In the Timeline view, click on the Expand button to display the Data view. 5. Staying on your mouth shapes layer, place your cursor on top of the drawing name (often a letter) until it changes to the swapping pointer. 6. Pull the cursor to see the list of mouth shape names and choose the one you want. The current drawing automatically changes to the new selection. You can also use the Library view to swap drawings. 2. In the Timeline view, drag the red playhead along the waveform of your sound layer. 4. 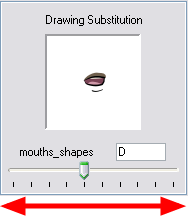 In the Drawing Substitution window of the Library view, click and drag the slider to choose a mouth shape. The current drawing is swapped for the one in the preview window.